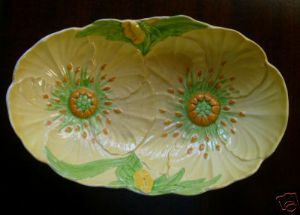 This is a highly collectable and immaculate Carlton Ware Serving Bowl in their Yellow Buttercup Design. It is a large double oval shape with a large buttercup central to each bowl well. The dish is one of the Australian designs from the 1936/1938 period with the impressed mark 1463/3 underside. The bowl measures 9 inches (23 cms) long with a width of 6 inches (15 cms). There is no visible sign of damage with just a little darkening of the colours in the well of the bowl.